I noticed my clematis were coming into bloom over the past few days, so this afternoon I thought I’d take a few minutes and photograph the young flowers before they fully mature and their delicate pink petals fade in the bright sunlight. While a few of them were perfectly presented, I discovered several were oddly deformed. 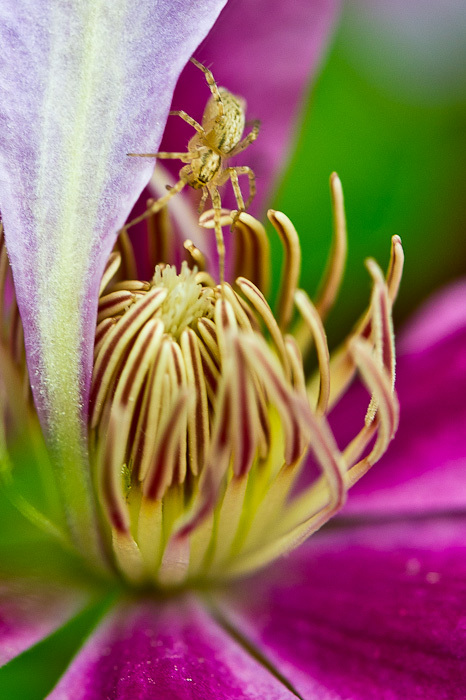 Upon closer inspection, I realized their petals had been rolled and manipulated into creative spider homes. As I knelt closer, I found one spider out and about, hunting for prey. As it stealthily crept down toward a foraging ant, I caught it for a moment as it descended. Although I didn’t quite get the photo I expected, I enjoyed discovering some new neighbors. Now if only they’d start preying on our resident stink bugs! What a lovely flower shot! What a wonderful poem! Thank you for sharing. I haven’t read Robert Frost in a very long time. Fond memories! Wow, Tricia – that is such a cool shot! Thank you! I appreciate your visits! como se llama esta flor? Esta flor es llamada columbine. Gracias! Great macro shot! I love to explore details that we normally can’t see.